Taking a spot of dust here and there in Photoshop is pretty easy, but recovering a full colorized image from a beaten down old photo is something else altogether. 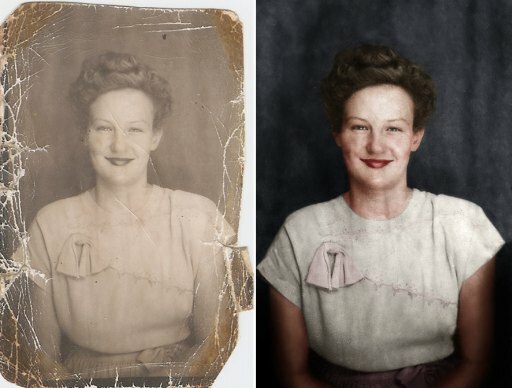 Retoucher and restoration artist THS Photo just released a time lapse showing the huge amount of work that goes into this type of restoration. 2.5 hours of working without using layers….brave! Asides from the removed cracks, how is the retouched result an improvement over the original? The cloudy aging is still there (which might be impossible to remove), but almost all detail is gone from the darker parts, and she now has two sausages for arms. At the very least, the colorization is a counterproductive step, IMHO. As it is, this is a pretty picture of a beat-up clown. I would honestly prefer the original to the retouched version. The “artist” who changed this photo has actually made a second photo. He has no way of knowing what color the blouse was; the color of her hair, etc. Unless it was altered for practice, this is something that no one should be proud of. This remembers me of the old, pre-digital era, black-and-white photo studios, which could “colorize” by hand a customer’s photo, and also restore very old photos. This is far from a good result, tough. The old-timers firmly believed on the “less is more” approach. You know, if you don’t like the result, that’s a matter of personal taste, but to tear this guy apart and say he has no skill is verging in ignorant. There is still plenty of details in the shadows, enough that you can make out layers in her hair. The dark background also still retained the original highlights and lowlights. Also as far as “sausages for arms”… Come on now. The arms were essentially redrawn using minimal cues from what could be saved from very damaged portions of the image, with good results. I think it’s easy to tear someone apart after watching the entire process condensed into a 5 minute video and comment about how it’s been ‘shopped and doesn’t look orgional. Let me guess, you can tell by the pixels right? Yes, it wasn’t pretty during the process, but I would challenge any of you to do a better job. Furthermore, I’d be willing to bet that this image provided to a “average person” would bring smiles to their faces, and in the end, isn’t it about making the “customer” happy? Comment all you want about the liberties taken in colorizing the photo. I think that’s a matter of taste that I personally thing was tastefully done. For the rest of the bashing, until you can compete on the same level, go back to processing HDR’s of your moms buick. So my opinion is invalid until I can prove I can do better? * I’m actually certain [i]noone[/i] can do better than that, given the heavily damaged source material. But just because noone can do better does not mean the result is [i]good[/i], or rather, that I have to like the result. Of course, as usual, this is my personal opinion: He went two or three steps too far. Also I’m certainly not saying the guy doesn’t have skill. How would I know, I don’t know him, he might be really talented and he certainly knows his way around Photoshop. But what the video shows is an exercise in stamina, in manual labor, less so in “skill”. Clone stamp and healing brush ad nauseum, burn and dodge, some lassoing and copying, and in the end a [i]very[/i] basic color overlay. He is doing very basic tasks, just a shitload of them. *) Full disclosure: My work occasionally includes retouching photos, I have done so since 1996. There was a clone brush in Photoshop 3, y’know? I’m sure the person who asked for the picture to be restored is very happy. Isn’t what’s important? The customer’s satisfaction? I just wish we knew more about the client and the desired outcome. If the goal were merely restoration, assuming colors that are functionally unknown clearly oversteps that boundary. Yet if the goal was enhancement on top of restoration, why did he put so much effort into rigidly bringing out the negative aspects of the photo (line on the neck, splotchy complexion, etc) rather than enhancing or in this case, minimizing them? I wish we knew more about what the goal was. As someone that had to do this with water color and re-shoot the images.. This was pretty well done. I enjoyed this. Th soundtrack was pretty good too !